I enjoy the looks of the current Range Rover, but I never gave much thought to what it might look like with two fewer doors. Why would I? Even in the current SUV boom, that seemed a bridge too far for Land Rover. Evidently I was wrong. If you have a boatload of cash, you can get the two-door modern Range Rover you demand, and it looks great. 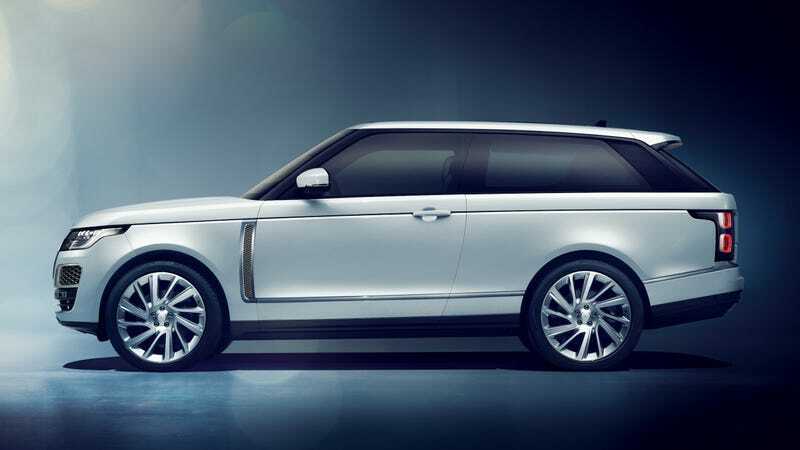 Meet the Range Rover SV, which Land Rover calls “the world’s first full-size luxury SUV Coupe,” throwing giant shade on all the other SUV makers who have stuck the “coupe” name on their vehicles. As you can see here, it’s actually deserved, as it’s down two doors like the Range Rovers of yesterday. You won’t be just walking into your dealer and picking one of these up, however. Each one is hand-assembled by the SVO Technical Center in England, and only 999 will be made worldwide. Each one starts—starts—at $295,000. But hey, you can have almost anything you want, including the option to customize interior leather colors by row to mix things up, plus a 557 horsepower 5.0-liter supercharged V8. It does zero to 60 mph in five seconds flat. I myself am buying five.